Where are you hoping to live? jjcorvino wrote: Just got my housing assignment, 530 Riverside Dr, #3C. Anybody have any information about the building? Preferably pictures? I still can't believe people will rent apartments without even seeing them. How hard is it to have pictures of a sample apartment in each building?! Damn, a friend of mine lives in Columbia housing on the same block and for a second I thought I could help. But he's in 548 Riverside (different building - looks similar in terms of date built/size though). It is definitely a nice location. Close to the park and to the 1 train, easy walk to campus. When do you have to accept by? I could try my best to check out 530 next time I'm hanging with aforementioned friend. Hm, I'm not sure how to describe it since it generally just looks like a typical apartment (not dorm-y like NYU housing) the exception being that it's gigantic - his bedroom alone is bigger than most studios (it's a UAH 3BR). 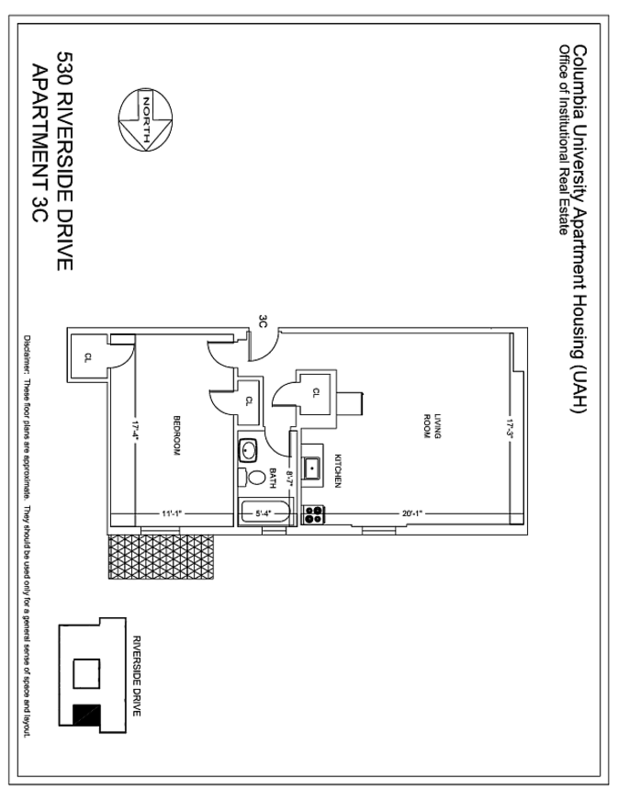 From the floor plan, yours looks big too (and 3 closets!). I doubt you'll find a better deal for that amount of space. I'd go for it if I were you based on that alone tbh (plus the fact that every UAH building I've been in has been decent/spacious), but Sybill has a good point too that you'll be able to expect a basic level of competency with maintenance/management, which is definitely NOT the case with most NYC apartments haha. FYI I just realized that Columbia's Lawnet seems to make the current address of recent admits public by default on everyone's profile (if it was there in the first place, as mine was). Not sure why you have to choose to "suppress" your current address as opposed to choosing to publish it. My app is approved and UAH is assigning apartments. Single. Has anybody gotten any confirmation on the loans? They never specified what account the money should be going to or if everything is confirmed and good after I sent them the form and filled everything out on the fed loan webiste. Ok, I think I decided to not take the housing. Called Columbia this morning and it made me a bit nervous. First of all, they said they had no pictures of any of the apartments to look at. Then they said that I could come look in person (from DC before monday ). Also, I rechecked their policy about Pets and I am not confident enough that it is ok. They said that pets are 100% against Columbia housing policy, but he said that "as long as they are not a nuisance" that they are ok. That is not secure enough for me. What happens when a neighbor decides they don't like my dog and decides that they want it removed? I would have no sort of protection. I think it will be easier to search for my own place. I am confident that I can get a good deal somewhere else. Ooh yeah that's fair, I didn't consider the pet issue. I'm sure you'll find something good! jjcorvino wrote: Ok, I think I decided to not take the housing. Called Columbia this morning and it made me a bit nervous. First of all, they said they had no pictures of any of the apartments to look at. Then they said that I could come look in person (from DC before monday ). Also, I rechecked their policy about Pets and I am not confident enough that it is ok. They said that pets are 100% against Columbia housing policy, but he said that "as long as they are not a nuisance" that they are ok. That is not secure enough for me. What happens when a neighbor decides they don't like my dog and decides that they want it removed? I would have no sort of protection. Do you mind me asking how much the apartment you were offered was? Trying to get a sense for cost vs quality in UAH. It came out to around 2,000 a month (utilities not included). Not a bad deal. I applied as a single and my housing status says "In process - Your housing application was approved and information has been sent by email". Does that mean I should have already received an email? It also seems like it says the next step is "UAH is in the process of assigning you housing - Offer Sent" and I don't understand what the difference is between that and the step I'm at now. Any insight? Last edited by texcellence on Mon Jun 12, 2017 10:49 am, edited 1 time in total. Last edited by 41262 on Thu Jan 11, 2018 4:39 pm, edited 1 time in total. Yikes I hope this isn't indicative of the lottery numbers. I submitted my housing application on the last day because they said it doesn't matter as long as it is before the deadline, but I'm still stuck at "Housing application has been received by UAH"
skigirl3136 wrote: I applied as a single and my housing status says "In process - Your housing application was approved and information has been sent by email". Does that mean I should have already received an email? It also seems like it says the next step is "UAH is in the process of assigning you housing - Offer Sent" and I don't understand what the difference is between that and the step I'm at now. Any insight? Same. Application was approved, but I haven't gotten an email. Has anyone who's still at this stage gotten an email? Nope, I also have yet to receive an email but my status has changed. Does anyone have any info on the 500 block of W 113th St? I just got my UAH couples housing assignment (Studio) there and did a little research and it seems that this is the "Greek Brownstones" street meaning they're all basically frat houses. I'm finding this hard to believe that they'd put a UAH building right in the middle of a bunch of frat houses. palalc wrote: Does anyone have any info on the 500 block of W 113th St? I just got my UAH couples housing assignment (Studio) there and did a little research and it seems that this is the "Greek Brownstones" street meaning they're all basically frat houses. I'm finding this hard to believe that they'd put a UAH building right in the middle of a bunch of frat houses. From a quick google search, Columbia owns/manages the Greek brownstones and they are technically "undergraduate housing," so it's not that weird. That being said, I would be potentially concerned about noise. Try asking in the Columbia students taking questions thread? Ya I didn't mean weird in the sense that it was somehow disconnected from Columbia University housing, but that they would designate one of those buildings as grad housing literally right in the middle of 5 fraternity buildings- precisely because of the noise and other nuisance factors. Might be a reason to decline. Certainly didn't plan on and do not want to live on fraternity row. Did anyone else get shafted by the move-in date? is before 8/12 (the start of rent for fall term). WiseAsianCow wrote: Did anyone else get shafted by the move-in date? I have the same problem. Did you call to confirm you will get charged that full amount or just some prorated version of that for the days you are actually in there? I have the same move-in period and saw the "summer semester" price but I hadn't even considered that I would have to pay for that until I read this. If anyone calls the office please post to clarify. I plan to call tomorrow regarding another issue so I will ask about it then if no one gets an answer before. Last year I paid pro rata for August. I moved in on 8/3. You shouldn't have to pay for any time before your move-in date. Yeah, I don't know how it is written out, but there is no way that is how it is supposed to work.